CHICAGO — higi celebrates the start of American Heart Health Month with the introduction of its ‘I Can’ consumer empowerment campaign and the launch of the Love My Heart program for February Heart Health month. With one in three adults in America having heart disease, higi’s ‘Love My Heart’ program is a powerful reminder to all consumers to know their numbers and increase awareness about prevalence, risk factors and prevention options of heart disease. The ‘I Can’ campaign is a targeted, year-long effort to raise awareness, provide health condition and prevention information, and empower consumers to take control of their health with higi screening data at the core of their health routines. Each month, the campaign will focus on one specific health condition – either Diabetes, Heart Health or Brain and Mental Health – with station screening information and resources available to improve consumers understanding and prevention of that condition type. This is the year for consumers to say “I Can” to taking control of their health with the higi information and resources available to make a difference. 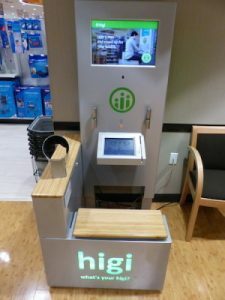 “We’re working to expand awareness and screenings and enable consumers to navigate to quality healthcare, especially those who struggle to access primary care,” said higi chief executive officer Jeff Bennett. During February alone, nearly 4 million free screenings will be completed at higi stations nationally to allow consumers to learn more about their heart health. According to the CDC, one in three Americans have high blood pressure and are at a higher risk for cardiovascular disease. High blood pressure raises the risk for heart attacks, strokes, damage to the kidney, eyes and brain, and many other issues. The excess strain and resulting damage from hypertension (high blood pressure) causes the coronary arteries serving the heart to narrow, which can lead to a heart attack. Uncontrolled hypertension also causes or worsens multiple other cardiac and vascular diseases. As American Heart Health month continues, consumers are encouraged to visit a local higi health station to know their health numbers and learn more about heart disease and prevention. For healthcare organizations seeking to connect and engage the underserved and difficult to reach patients, higi offers a scalable, community-based network for guiding patients to care. higi will be attending the Health Information and Management Systems Society Conference (HIMSS) in Orlando from February 11 – February 15 to expand this growing network that connects healthcare stakeholders with consumers. Learn more by visiting them at booth 7366 or by going to www.higi.com.